Nothing lasts forever, single wall steel oil tanks can and do leak. When tanks were originally buried, which ranged from the 1930's to mid 1980's little thought was given to life span of the tank or the need for removal. Over 20 years of hands on environmental experience allows Curren to offer a range of environmental options to address a tank (UST or AST) leak. While remediation methods, such as bio-remediation, soil vapor extraction and pump and treat systems have been employed at contaminated sites for years, more often than not Curren has found that the removal of the source of the contamination (UST) in conjunction with the surgical removal of petroleum impacted soils is the most time efficient and cost effective way to remediate a heat oil tank discharge. Oil tanks are a concern today as oil can leak to the extent that remediation (soil cleanup) is necessary. Most all tank removal costs do not exceed $2,000.00, but oil tank leaks, even small ones, can easily cost $5,000.00, $7,000.00 or more. To be blunt, oil tank leaks are more a financial problem than an environmental issue, meaning rarely are tank leaks causing immediate harm to our environment. Environmental regulations are strict and that is what drives the need to remediate petroleum compounds when they leak to the extent that oil levels are above environmental regulatory levels. We have seen most every tank leak scenario you can thing of and then some. 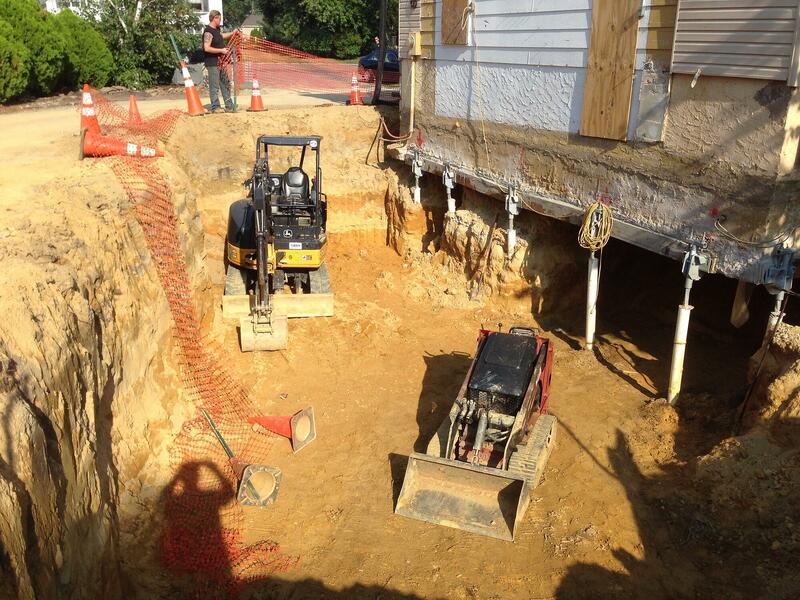 The tank leak above, can lead to a soil remediation like the photo below. 1. Not every oil tank leaks. 2. Not every tank leak requires remediation. 3. The need for remediation is based on quantitative data i.e., laboratory analysis. How do you remediate a tank leak? If you are told the tank leaked you must determine if remediation is necessary. 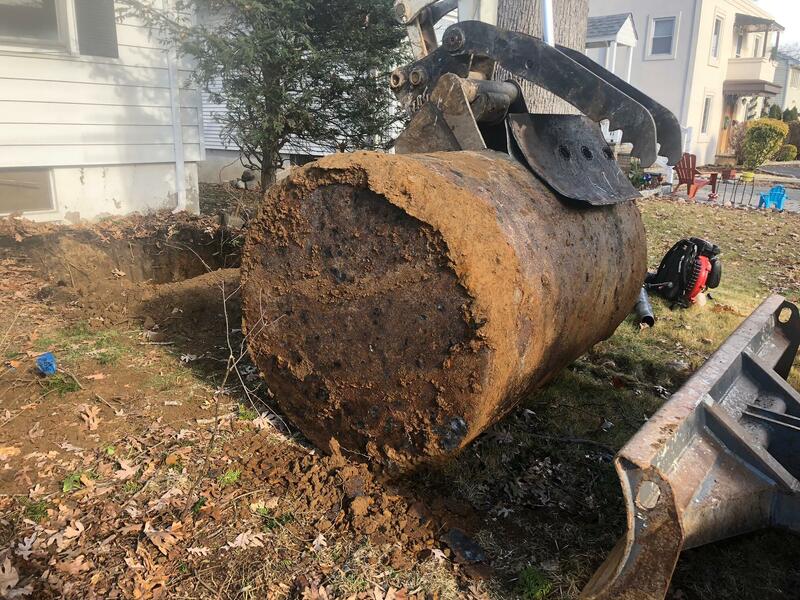 Once you discover an oil tank has leaked, initial site assessment soil sampling is performed to determine if oil levels are above or below permissible limits. Every state has an acceptable and unacceptable concentration of oil that can remain in the ground, similar to cholesterol, there are both good and bad levels. Once you determine what the levels are you can proceed to either closing out the tank leak, if levels are permissible or if oil levels exceed permissible limits you move to a diagnosis stage which is by providing remediation services pertaining to heating oil tank discharges. My oil levels are above standard and need remediation, what next? 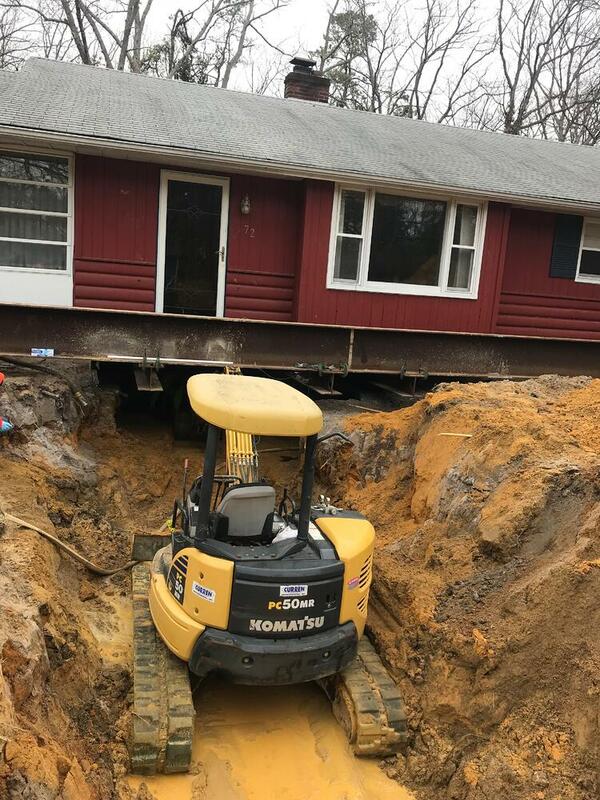 So the underground heating oil removed was found to be leaking. So the question that needs to be answered is how large or small of an area will require remediation. To determine the extent further investigation of the tank discharge is necessary. This is completed by advancing soil borings both within the tank excavation (to determine vertical extent) and around the perimeter of the former tank location to determine the horizontal extent. This develops a form of 3D model of the extent of contamination, and then a plan can be developed to remediate the contamination. 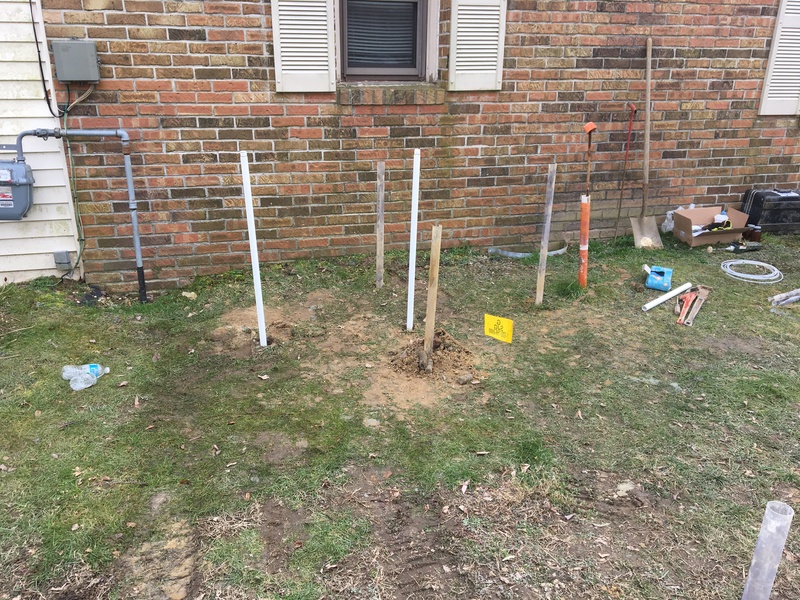 In addition to determining the extent of the soil contamination, depth to groundwater should be determined. Any potential insurance company response to a homeowners claim will be based on if oil impact is noted at the groundwater table. The center of the photo was a removed tank that leaked. Soil borings are drilled around the area to determine how far the oil has traveled from the tank area. The investigation consists of advancing the Geoprobe and providing sampling cores and soil samples that are obtained from the highest field screened reading as measured by a PID (vapor meter). Soil borings are advanced in and around the former tank location to help define the extent of the plume. Of these borings, six soil samples are ESTIMATED to be obtained and analyzed. The actual number will be contingent on what is found during the investigation. The laboratory data will be reviewed and a site sample location sketch, data summary tables and raw laboratory data will be submitted with a summary report defining the extent (size of plume and quantity of soil requiring removal) as well as reserve amount required for remedial activities. The tubes you see sticking up from the ground represented drilled location to determine the extent of the oil. When a tank release is suspected or confirmed, Curren can assist property owners to assess the situation, quantify the extent of the problem and provide remedial options to address the situation. If there is potential for insurance coverage, Curren offers forensic analysis of oil to determine the date of release to see if possible an older insurance policy afforded coverage. Curren develops remedial action work plans, arranges on site assessment of the dwelling with structural engineers or state regulatory agencies, and can either provide the expertise to oversee a remediation project performed by another company or to implement and complete the remediation in a turnkey fashion. 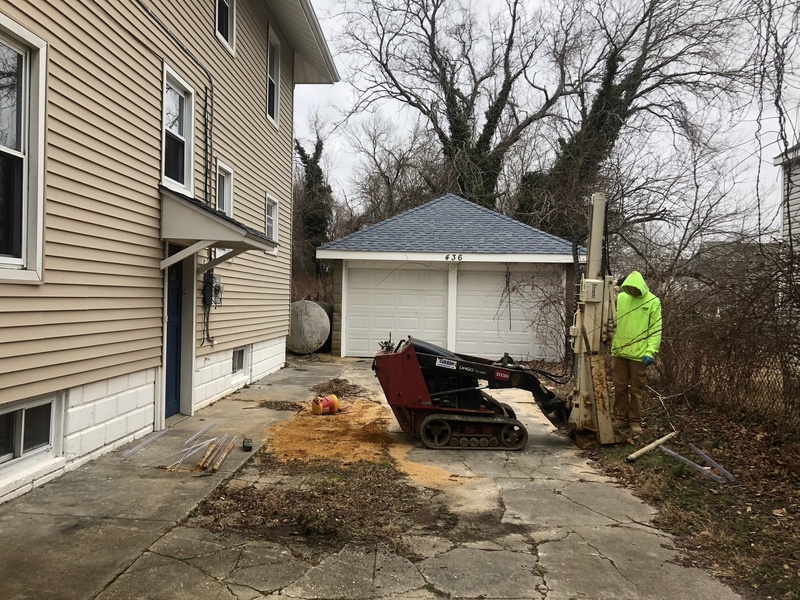 Being a professional remediation contractor, Curren has extensive experience in the hands on management and implementation of remediation projects. Our clients benefit from our experience and professional work manner which helps to guide a project from discovery through to fruition where the ultimate goal is the No Further Action (NFA) determination from the state regulatory agency.